I had a mini-La Plagne moment yesterday, except instead of yelling “It looks like Stephen Roche. It is! It is Stephen Roche!”, I opted instead for something cruder but more concise: “F*cking hell, it’s Wiggo.” TeamSky’s marketing department can have that for a slogan, if they like. It was one of those lovely moments in cycling when both the action and the camera placement were perfect: Nibali has surged ahead, overtaken the fading Nico Roche and is grinding towards the summit with Dan Martin for company, Moto 1 has pulled ahead so the camera can look into the faces of this select pairing of riders, and there, in the background, is Wiggins leading the charge, steadily and calmly closing the gap on the defending champion, neither asking for nor needing the help of the GC men who’d stayed with him. The chase pace he’d sustained had already seen off race leader Rodriguez and hot contender Michele Scarponi, and strong climbers like Mikel Nieve. Not content with merely catching the defending champion, Wiggins took to the front of the group, put his head down and did his utmost to keep the pace high. It wasn’t so much an attack as a softening-up process, one that would put enough pain in the legs to see that the group would splinter when Dan Martin made his final dash for the line. Martin won the stage, Bauke Mollema took the race lead and Chris Froome’s robust chasing marked him out as a future team leader, but the day really belonged to Wiggins. His transformation into potential Grand Tour winner supposedly occurred during the 2009 Tour De France, when he had his most credible performance ever in the mountains, but even then I had doubts. His newfound mountain goat reputation sprang from the fact that he wouldn’t lose contact with the big names until the final Ks of the climb. Admittedly, that’s a better performance than 90% of the peloton can manage, but while getting dropped late might not damage your time as much as getting burned off early, calling him a GC contender simply for losing time less dramatically than everyone else seemed a little premature. After all, this isn’t the nineties and we don’t get 80-90k of Individual Time Trialling in Grand Tours anymore. Wiggins is at his best against the clock, and the ability to limit your losses in the mountains is no help if you don’t have the TT kilometres available to inflict losses on your rivals. Yesterday changed all that. Wiggins didn’t just limit his losses in the mountains, he inflicted losses on serious rivals. Furthermore, he chased and caught a grand tour winner and instantly assumed the leadership role in the group, taking the front and setting the pace with no deference to Nibali’s status. There’s a lot of internet hand-wringing today which suggests that he may have gone too deep and burned reserves that would have been more efficiently used today in a TT which more naturally fits Wiggins’ skills, but I doubt that a rider as canny as Wiggo, riding in a team as scientific as Sky, would have made a blunder like that. More importantly, much of the early effort was made by Chris Froome, and even his later efforts didn’t leave Wiggins looking like he’d gone too deep. He looked like a man who’d ridden well within himself. Today we have a flat Time Trial without any real tricky bits and it seems likely to be won by Tony Martin or Fabian Cancellara. That’s pretty much a given - if Martin and Cancellara are there, the only question is whether the course has the technical sections that give Cancellara an even greater edge. Today doesn’t look too twisty, so I’m favouring Martin. The important thing, however, is what Wiggins will make of it. I’m expecting him to be the highest placed of the GC men, slightly ahead of Brajkovic and Kessiakof, significantly ahead of Nibali, and whole minutes ahead of Rodriguez, Scarponi and Anton. With seven mountain stages to come, including the Alto del Angliru on stage 15, this is still a race that favours natural climbers rather than a converted track rider with a dedicated WeightWatchers plan like Wiggins. Even so, I’m now a believer. 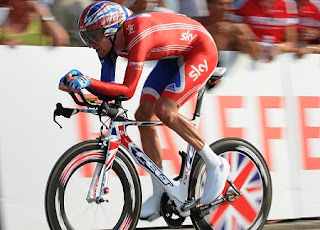 In my Vuelta preview, I suggested that top ten was the best Bradley could hope for. That prediction was based on a Bradley Wiggins who wouldn’t fall off the mountains until the final yards, but the Bradley Wiggins who might not fall off the mountains at all is a different prospect. He can take enough time today, and defend it effectively enough in upcoming days, that a podium place is a strong possibility. A mod like Wiggins would probably have misgivings about being the subject of a post named after a Monkees' song, so he’ll really hate a Bon Jovi reference. Nevertheless: keep the faith.